This 3/8 inch wide by 15 yard roll of delicate white cotton eyelet ribbon is ideal for any sewing or craft project. Use it for fashion accessories, clothing, embellishing handmade cards, gift baskets, hair bows and bands and box bands. Also available in a 5/8 or 1 inch width. 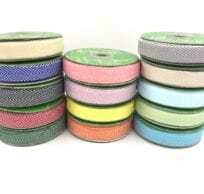 This 1/2 inch wide by 15 yard roll of delicate crochet ribbon is perfect for vintage crafts and handmade cards. Embellish home decor, clothing and fashion accessories. Add it to an elegant ribbon on wrapped packages for added beauty and texture. Available in a variety of colors.